In class today we had a fairly spirited discussion about the evil, or perhaps not so evil(?) corporation, Wal-Mart. We talked about the traditional reasons people hate the company, ie. it takes $$ from the community without putting any back in, it doesn't promote local agriculture or industry, continues to outgrow and build buildings, and wastes large amounts of resources shipping across the nation, etc. Our professor, who had worked as a lawyer helping employees with disputes with their companies over medical leave, etc, had a different view. She stated that Wal-Mart more often worked with their employees to help them through the tough situation, and keep their jobs. Now in part, that is due to the nature of large business, they can absorb the cost of paying an employee who is temporarily unable to work, in a way that Mom and Pop stores would be unable to. Another issue, and to me the more pressing one, was the issue of environmentalism. Wal-Mart is riding the green revolution wave, to tell their customers how they can make change to benefit the environment, they're trying to reduce shipping and packaging, and promoting local agriculture and products to some extent, and is even providing their truckers with space heaters to reduce idling on the roadside while drivers get some shut-eye. These all seem like good changes, and in truth they are. While Wal-Mart, and large corporations like them certainly have the power to do more, this is a generous leap in the right direction. Companies that big have the ability to influence change, by demanding their suppliers change. The environmentalist community has to a large extent not gotten behind Wal-Mart in this action. Old habits die hard, and it's easy to hate the corporate giants, but supporting them in this endeavor will hopefully continue to foster further change. My professor made an extremely valid point that Wal-Mart and Coca Cola, and other large multi-national corps reach Americans that generally aren't on top of environmental issues. 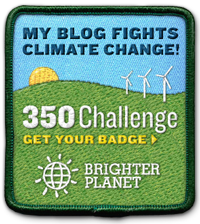 Who don't regularly read up on the latest scientific discoveries, or follow the environmental blogs of groups like Greenpeace and WWF. These are the Americans who may not believe global climate change is happening. If Wal-Mart can do their part to transition, America may well follow. While they have a long long way to go, I for one will commend the changes they have made, and watch for further future change. 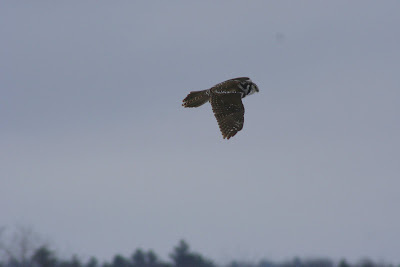 Yesterday I birded up in the Burlington area with a friend and fellow birder from VLS. We headed up to Burlington Intervale to start our day, where there are steaming piles of compost that birds enjoy. Probably both to pick through for food, and for the heat they give off. There we got two Glaucous Gulls, and saw a handful of red-tailed hawks sitting on the warm compost heaps. 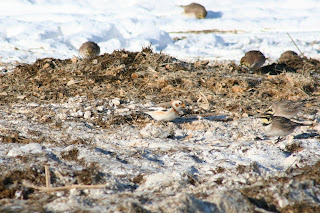 Snow Bunting in with a Horned Lark flock. Then we headed to the breakwater, where we saw Iceland gulls sitting on the breakwater with Greater Black-backed Gulls. Got my state mallards ;) and saw some common mergansers. After grabbing a sandwich we headed toward the agricultural lands south of Burlington, where our target species were longspurs and buntings. 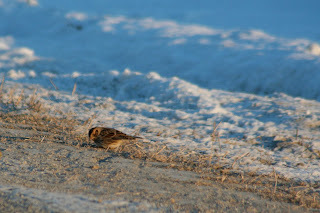 We pulled off and walked a few feet onto a farm where we got some good looks at snow buntings in a flock of horned larks, before the farmer came up and questioned us. We continued driving around the ag lands for the rest of the afternoon, and were rewarded with good looks at a lapland longspur on the ground next to our car. 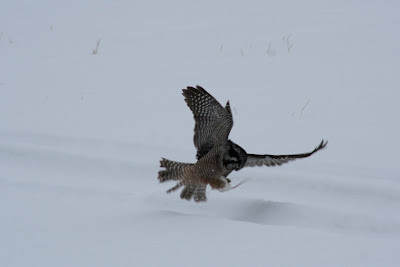 We struck out on rough-legged hawks, the species Peter guaranteed we'd see, hehe. It's okay, I'll have more opportunities this winter to try for them. Hoping to go snowshoeing early next week before classes start back up again. Took a short hike in the snow today. There was light snow falling for most of my walk. 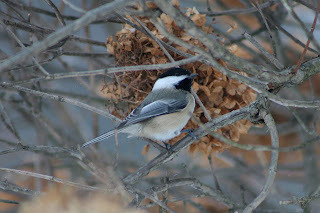 Birds were quiet, just the occasional small chickadee flock. 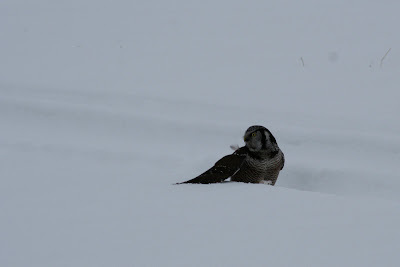 By someone's house I caught a few dark-eyed juncos and one downy woodpecker calling and moving around a tree. First birding trip of 2009, Irvine Ranch Conservancy hike along Quail Hill Loop with Evelyn. February Wildflower Hike with Irvine Ranch Conservancy along Loma Ridge, over Limestone Canyon. Night Hike up Agua Chinon Canyon to the back side of the sinks, with IRC. April OC Birdathon with Neil Gilbert and Vic Leipzig, got my life spotted owl! Taking a sunset photography lesson with professional photographer Andre Torng. Filming Wild in the City pilot in LA county with some birder friends and Richard Crossley. Picking Lois Taylor's brain on plant ID on the IRC hike in Round Canyon. Catalina was one long awesome birding memory, but the West End hummer tour stands out. Hiking up Kent's Ledge to see the fall foliage changing in Vermont. 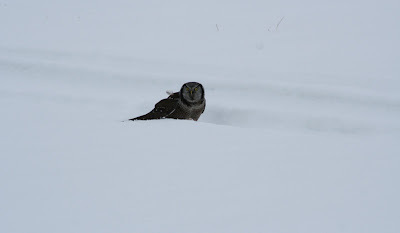 It's not birding, but the first snowfall in SoRo was quite a memorable experience. Finally, I counted, and according to eBird, I got 14 lifers in 2009! This morning I birded Bonita Creek Park and Arroyo Park and the drainage in between. The diversity was pretty dismal, but certain species numbers were extremely high *cough* yellow-rumps *cough* Too many early morning joggers/walkers, especially those with dogs, about 3/4 of which were not on leashes. Grrrr. Best birds for me probably were the California gnatcatchers calling from the hillside below the Bluffs shopping center (loads of coastal sagebrush growing on the slope probably helped) and a gorgeous look at a hermit thrush near the back entrance of Arroyo Park. The area under the Bluffs shopping center was extremely birdy, plenty of stuff calling - I really had my fill of birding and counting by ear today, let me tell you! I ended up by Harbor View and Bonita Canyon in the sports park complex, where the most common birds by far were European starlings - ick. Today I went birding with Grace and Alex at my old stomping grounds, the San Joaquin Wildlife Sanctuary. We got about 44 species in three hours, not bad for a leisurely stroll around the marsh. I had no trouble IDing most species, but for some reason I kept seeing mallards at funky angles and making them into all sorts of things, sigh, I must be out of practice. Best bird of the morning was the common goldeneye we watched fishing under the footbridge heading toward the riparian area of the marsh. We stopped by Upper Newport Bay on the way home to check for the Bar-tailed Godwit being reported in the rocky mud flats under the Jamboree underpass. No luck today, but I'll go back every morning this week until I fly home and keep trying for it. Tomorrow I'm going to do the Christmas Bird Count in my area, I'll just be counting at the park within walking distance from my house, but hopefully that will be helpful enough. Good to be birding in 2010!